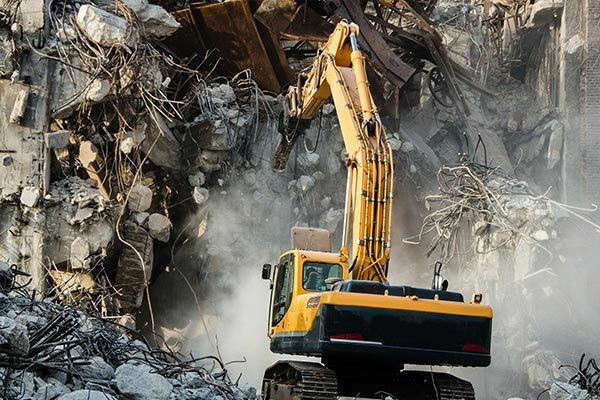 Be it a commercial, residential or an industrial space, we have the apt expertise along with state of the art equipment to carry out demolition of any scale. Our trained professional and highly qualified team will ensure the safety of your property, investment and the surrounding environment. We provide exceptional services pertaining to property demolition including Asbestos Testing and Asbestos Removal. We have a package for heavy demolition in which we conduct phased removal of the whole building and structure. Our services also include hard and soft demolition along with partial or selective demolition and also site clearing. All of our services are provided by experienced and trained personnel having a proven insight into the whole demolition phase. Our staff is technically well-trained to use equipment and will get you the best results for your requirements. We are available 24/7 all year round so we’re always there when you need us. We have certified prowess in the field and we are prepared for projects of any scale. Our team is filled with knowledgeable and experienced experts that will get you a clean site with exquisite precision. We are frequently called for demolition services by various property managers and individuals seeking to renovate their property’s interior. We are a respected service provider across the region as we have our own meticulous method with which we ensure timely and cost-effective demolition. We have in place a system of safety preparation practices that guarantees that we are always prepared for medical emergencies, and have swift access to local police and fire departments. Our preparation practice also includes compliance with the Occupational Safety and Health Administration guidelines. Your safety and peace of mind is our number one priority. We are a 24 hour emergency service dedicated to our customer’s needs. We pride ourselves on our reliability for any size job.